How does one reinforce his or her appreciation for living in Oregon? I started wondering this when I was only twelve after we moved here from Ohio – a courageous decision by my parents in 1960, since they were building a new house in Cincinnati and my dad had no job out here. 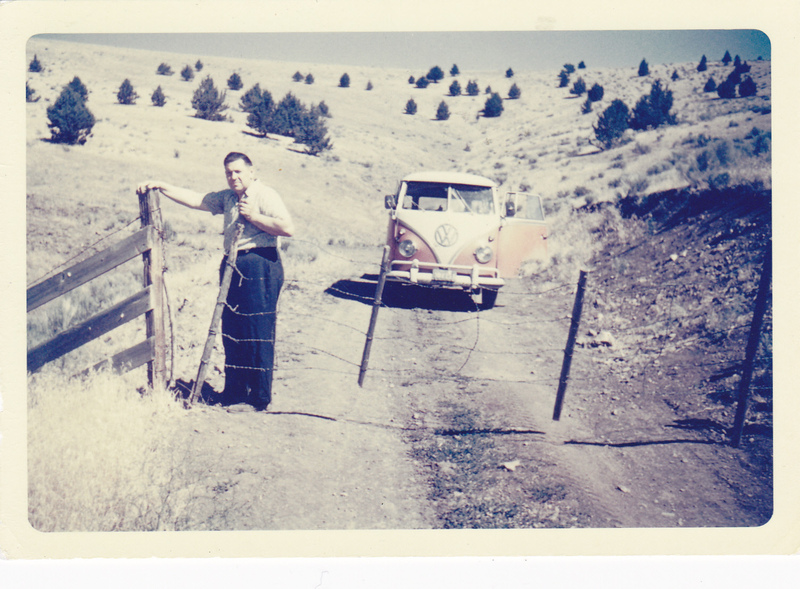 He moved to Oregon City while my mom stayed back and sold the house and then she transported the four kids (ages 8 to 14) on a cross-country road trip. They raised us to always look for the “Spirit of High Adventure” and we did repeatedly on his carpet sales territory in Eastern Oregon. 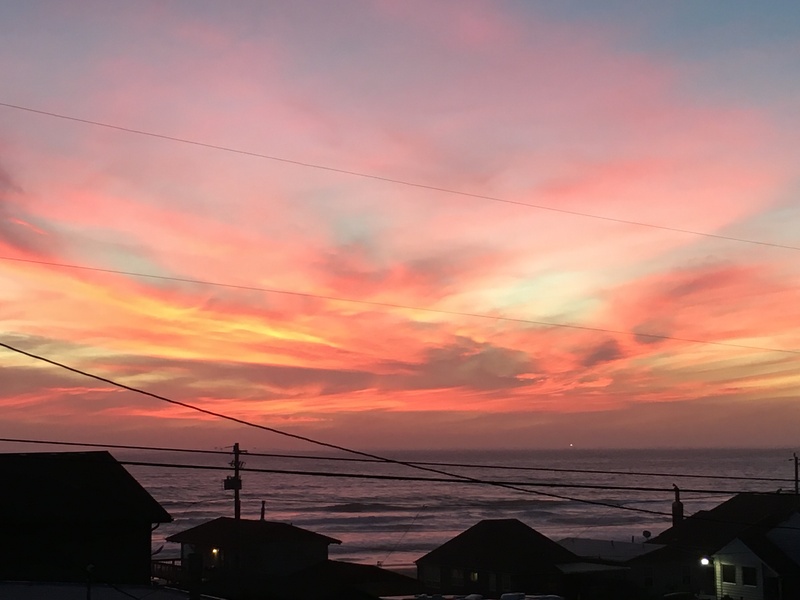 The opportunity, however, for us to escape for a week in Arizona in late January when it was dreary and KGW’s weather guru Matt Zafino was predicting “Significant precipitation for the next week,” sealed the deal along with a Companion Fare on Alaska Airlines. 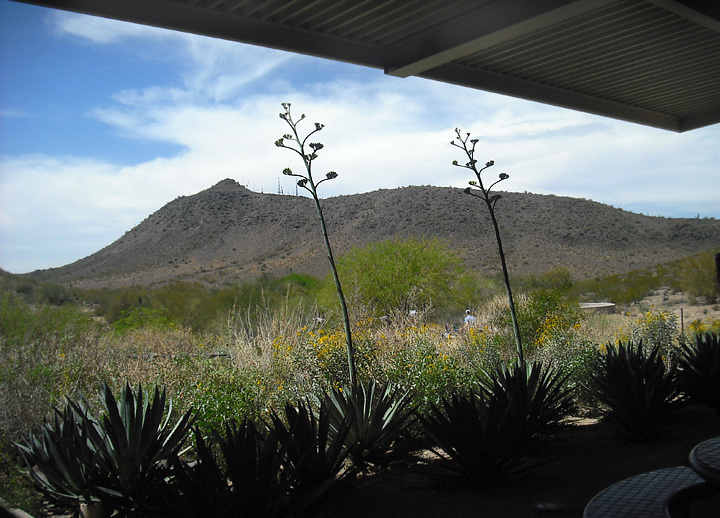 “Let’s go to Phoenix/Scottsdale and sit in the sun, read, hike and Beerchase.” (not necessarily in that order) at a number of breweries and pubs. We’d be there too early in the year to see Spring Training, a favorite pastime, but it would be a great respite. Well the weather that week ended up being pretty reasonable although on the night we flew in, the server at our roadhouse (a very good Chelsea’s Kitchen) admonished us to “Stay warm!” as we left with strong desert winds whipping and temperatures in the mid-30’s. 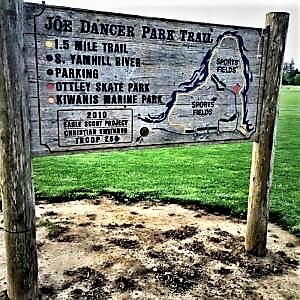 However, the overall ambiance of this “disaster in urban planning,” made us immediately homesick for the concepts we take for granted – like trees, urban growth boundaries, good public transit, intersections which don’t require a ten-minute wait if you hit a red light, trails in Forest Park and, of course, the Oregon Coast. 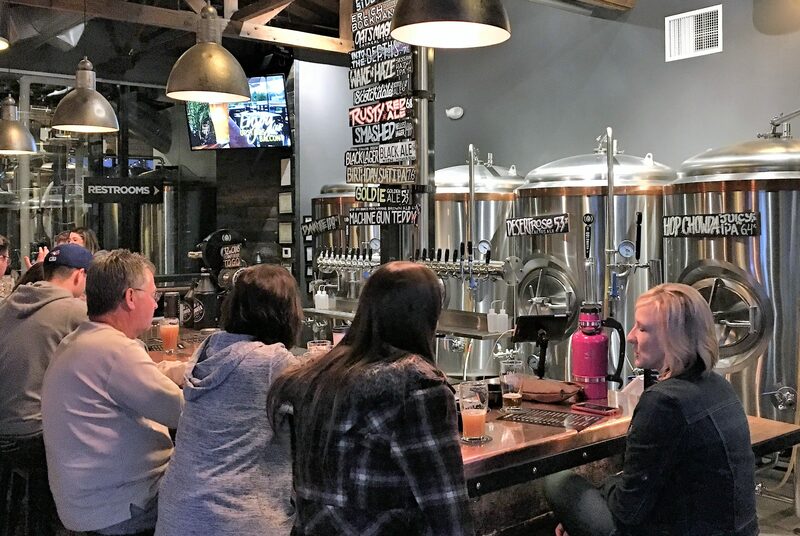 While Portland breweries surpass every city on the globe, Phoenix and Scottsdale have made great progress and have a thriving beer culture with about thirty venues. 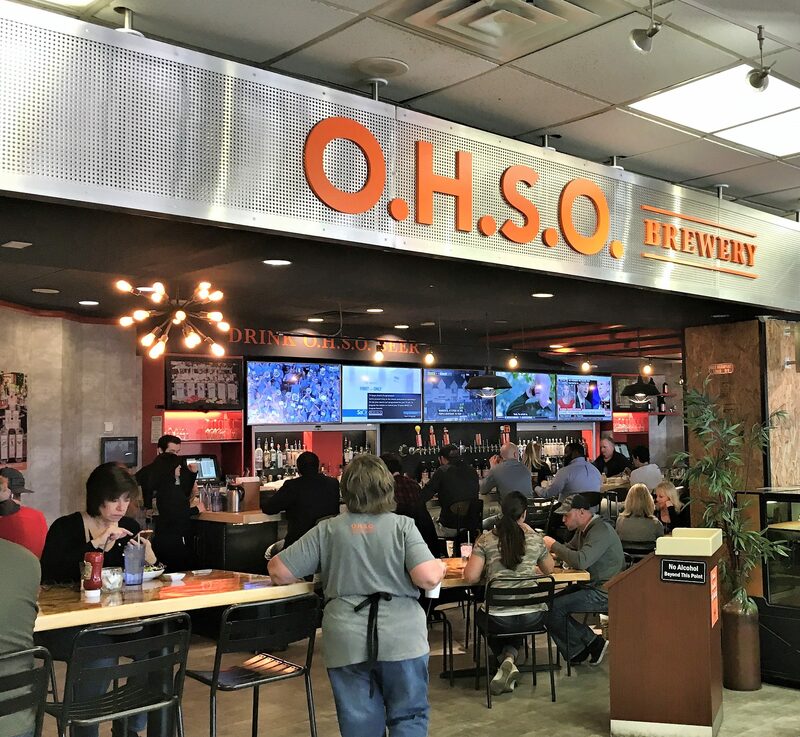 We passed two brewpubs packed to capacity on the way to the baggage claim at Sky Harbor Airport – O.H.S.O. Brewing and Four Peaks Brewing. 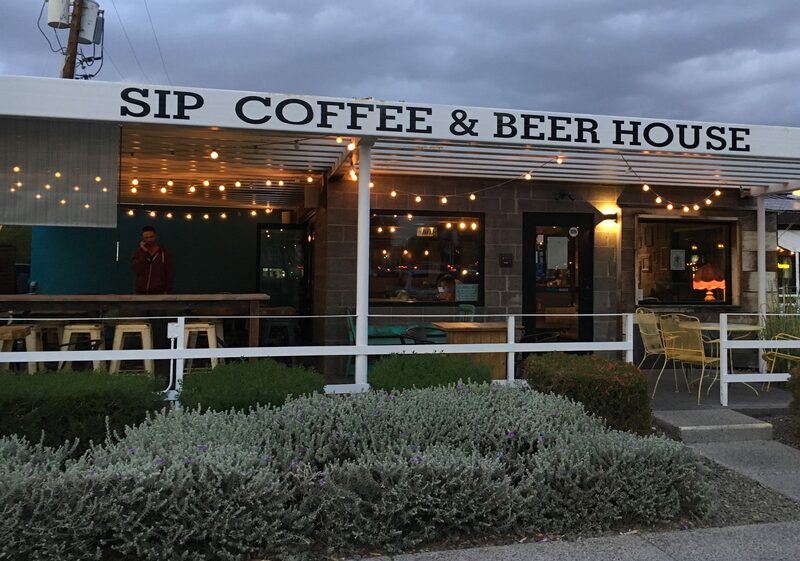 The acronym of the former stands for Outrageous Homebrewer’s Social Outpost. O.H.S.O. in the airport – great BLT sandwich! 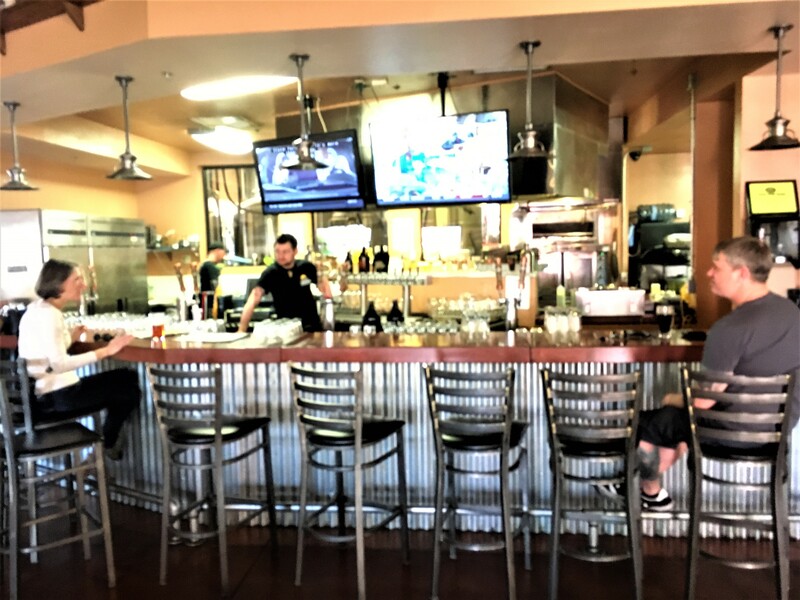 We also visited O.H.S.O.’s Scottsdale brewery and stopped for a quick albeit delicious BLT sandwich at their airport pub while we were waiting for our return flight.. 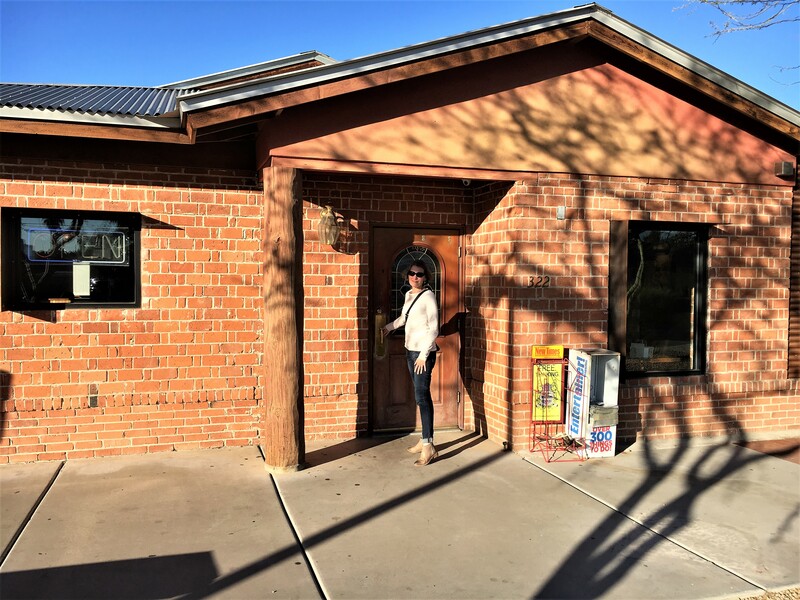 The fact that Four Peaks had been acquired by Anheuser Busch in late 2015 dampened our enthusiasm for visiting what is now a corporate extension although both Ten Barrel and Elysian in the Northwest have gone the same route. 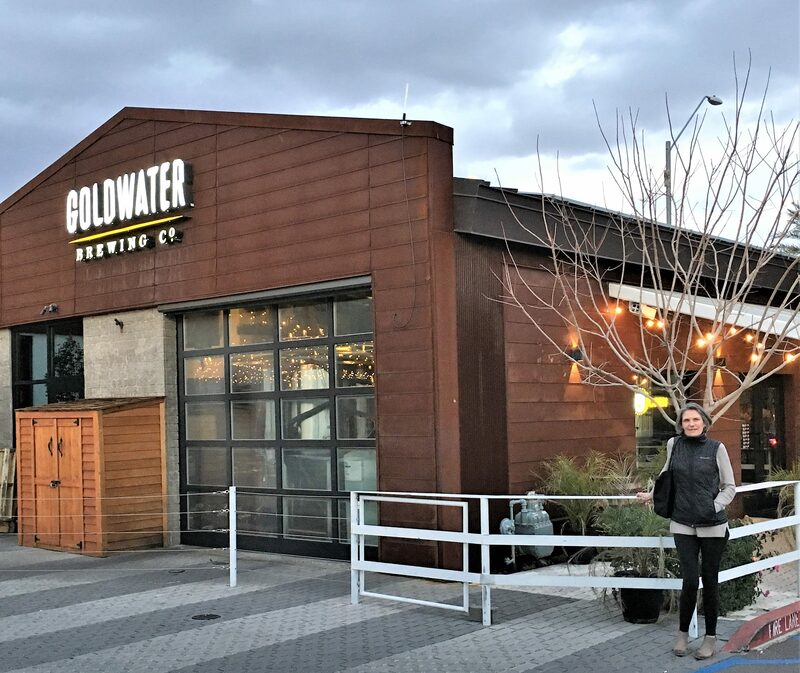 The first night we started with what became our favorite and was also the most interesting – Goldwater Brewing Company. 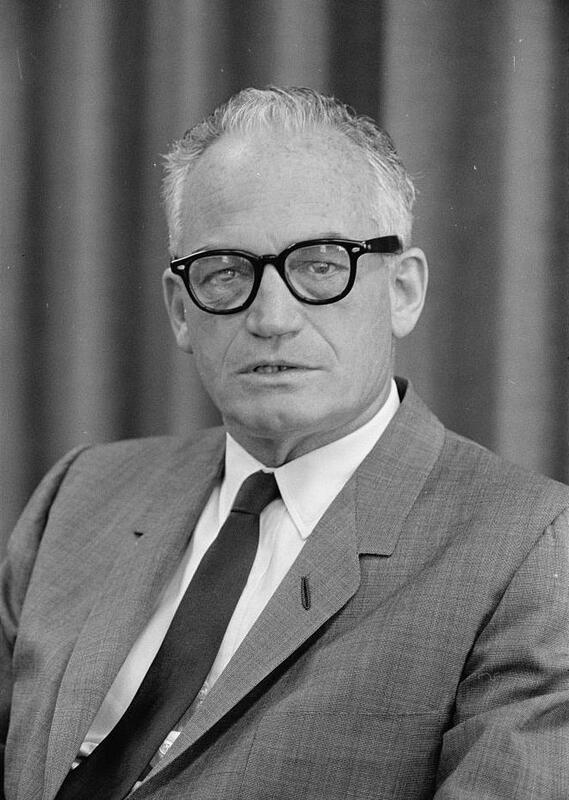 It was named after the late Arizona icon, Barry Goldwater, a retired US Air Force pilot and Major General who served five terms in the US Senate and ran for the Republican Presidential nomination in 1964 against Nelson Rockefeller. His campaign slogan was, “In your heart, you know he’s right.” He was portrayed as a militant conservative who, if elected, would lead the US into a nuclear war with Russia. 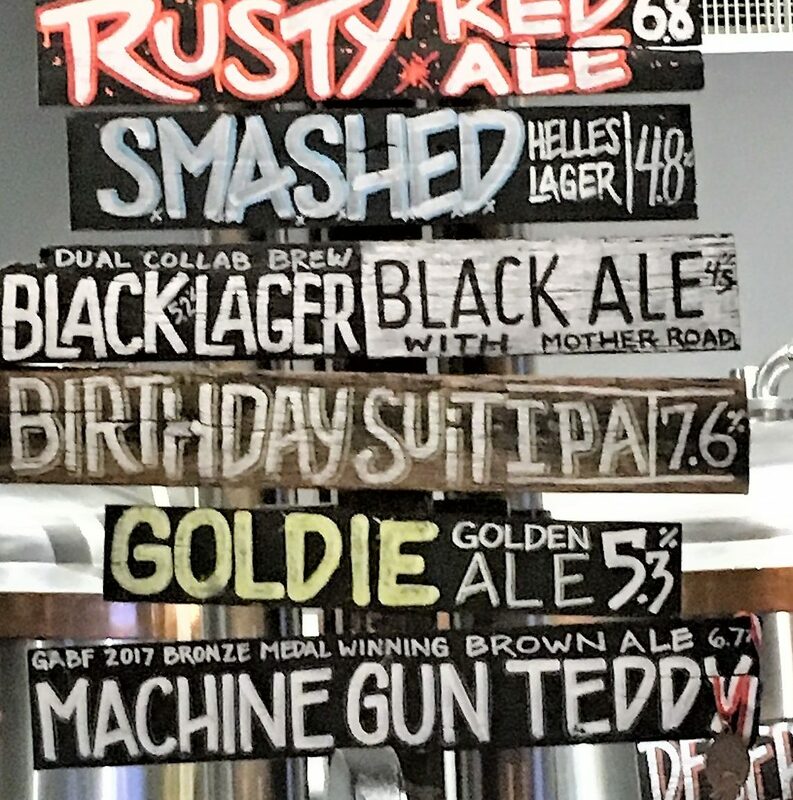 Now there were no B-52 models hanging from the ceiling at the great family-owned brewery, but their flagship beer, which won a bronze medal at the Great American Beer Festival, was “Machine Gun Teddy. While this might seem clever in Arizona, in light of recent events, it makes one wonder if they will still advertise it as “cuddly,” or in the interest of discretion, rename it. Is this an appropriate name for a beer? Two Brothers Brewery and Taphouse – After Goldwater, this one was a disappointment although at least they were located in a renovated historic building and had a good line-up of beers although just five of their own. 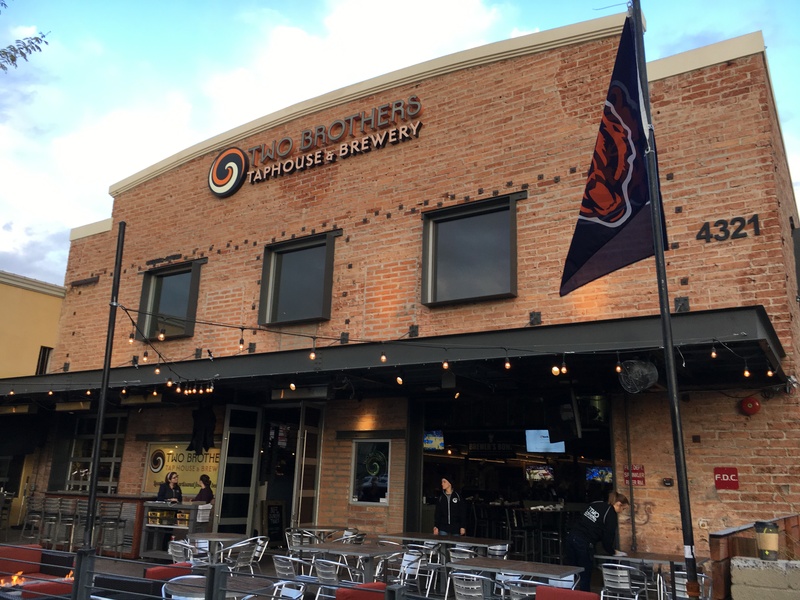 Two Brothers is a Midwest brewery based out of Chicago that opened a brewpub in Scottsdale (probably so the brothers could deduct their winter vacations……). It’s like going into a Rock Bottom Pub – more restaurant than pub with some young and effusive woman out front who are eager to seat you and a bartender who would rather be watching one of the games on their many wide-screened TV’s than serving beer. 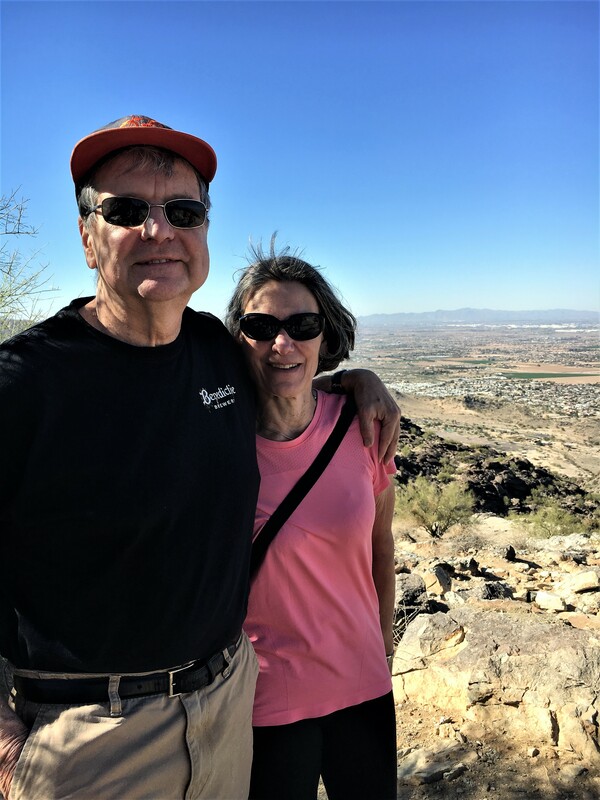 The next day, we hiked up Shaw Butte, which tops out at 1,380 feet and gives a nice view of the desert to the north and Phoenix to the South. It was much better than our attempted hike the next morning in South Mountain Park – purported to be the third largest municipal park in the world with “miles of hiking trails.” Now maybe we hit the wrong entrance, but all we saw on our abbreviated walk in the park was freeways that ran directly by high-rise buildings. 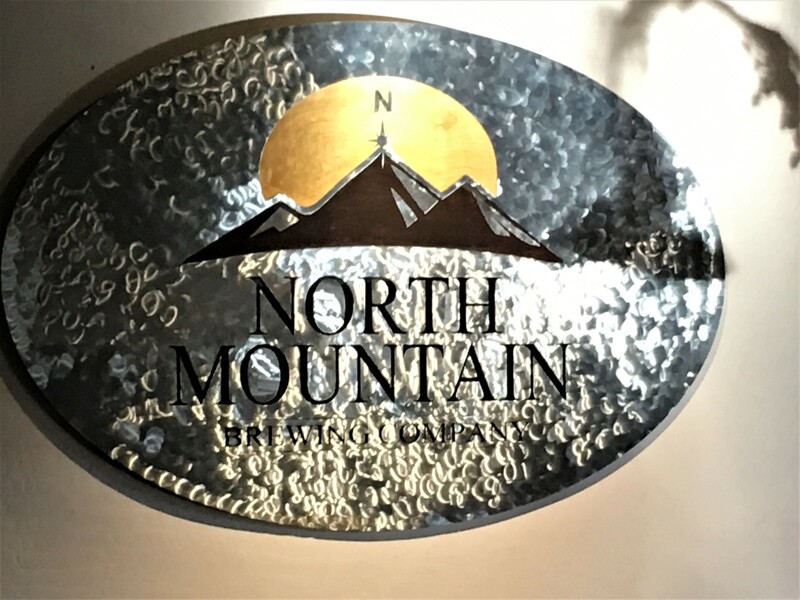 After the walk up Shaw Butte, we hit North Mountain Brewing, a microbrewery and gastropub where we talked to Bernie, the affable bartender, who had worked their five years and was spot on with his recommendation of the Sessions IPA. 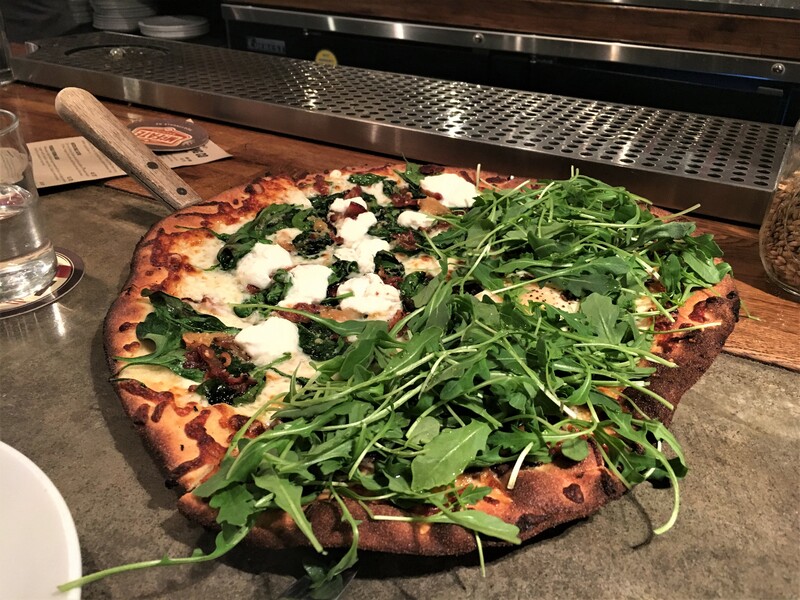 The brewery is in a strip mall and doesn’t have great ambiance but gets rave social media reviews for their food, which transcends just pub faire. A few common themes emerged from the watering holes we visited. First, the bartenders, almost without exception were great people. They each let us sample their different beers – and even encouraged us to do so. (Some misguided Portland brewpubs even charge for this courtesy, which is pretty short sighted.) They were knowledgeable about beer. Secondly, when we told them that were from Portland and about TheBeerchaser blog, almost all suggested competitors that we should visit to see the best Phoenix/Scottsdale breweries. 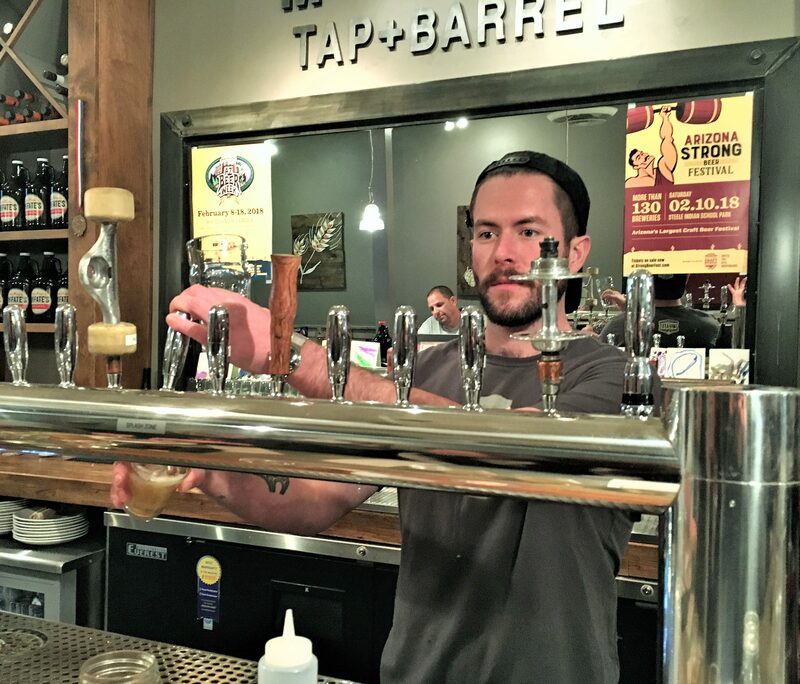 In fact, Bernie recommended our next stop – SunUp Brewing – as did just about every other bartender. 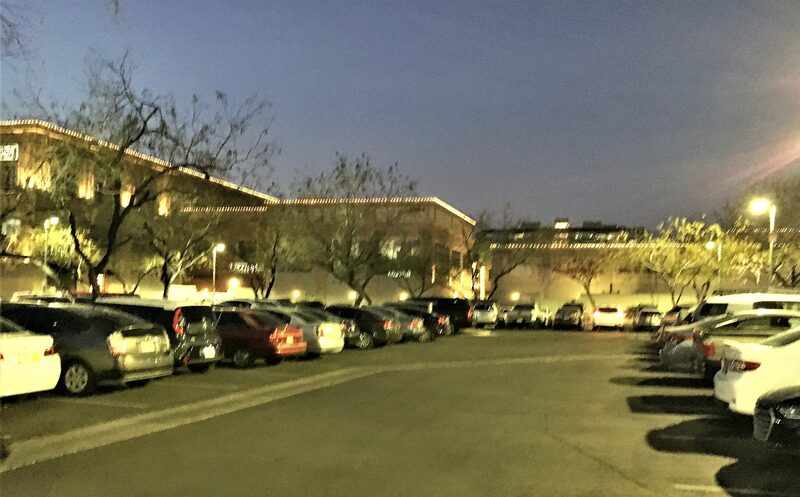 Another trend, albeit, negative, is that almost all the breweries and pubs (and just about every other commercial enterprise) was located in a strip mall surrounded by parking lots that are usually full. 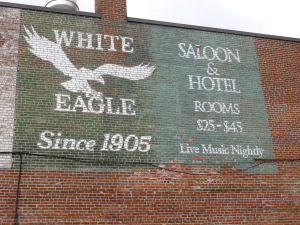 The historic ambiance of Portland gems such as the White Eagle Cafe, Gil’s Speakeasy, The Rambler (all of which I have reviewed and could go on) not only have warm interiors, but very interesting or idiosyncratic exteriors which makes Beerchasing a lot more enjoyable. Metropolitan Phoenix (The Valley of the Sun) has a population of 4.3 million and the City itself a density of 2,797 people per square mile. That compares to Portland’s 4,537 and Portland is near the bottom in density for West coast cities. The Valley of the Sun seems to be the epitome of urban sprawl. While the road system is pretty good (I assume the Mexicans paid for it..) it takes a long, boring drive to get almost anyplace. “Density” must be a pejorative term as evidenced by even one of their athletic teams “The Phoenix Sprawl” Okay, it’s an Ultimate Frisbee Team, and I guess that’s better than the San Diego Wild Fire in the same league, but don’t embrace the concept! 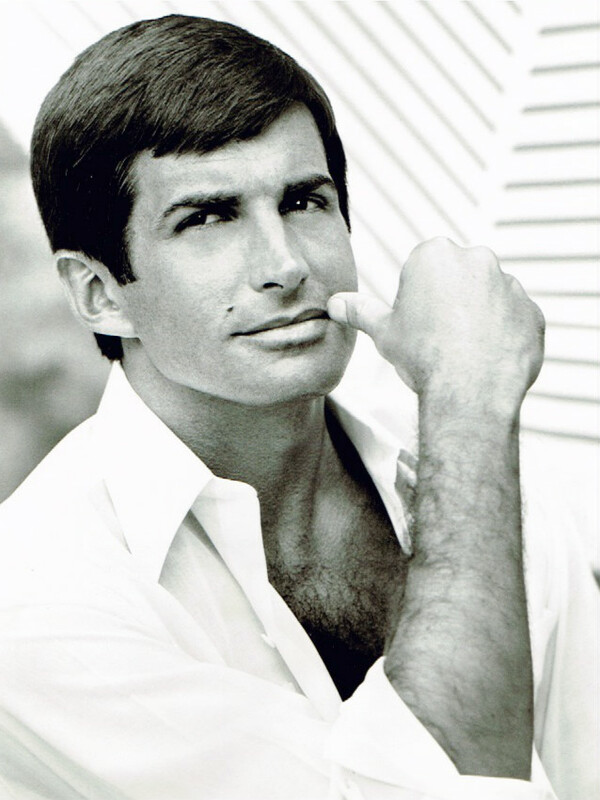 George Hamilton stories and more…..
One of the more interesting chaps we met that week was sitting at the bar at SunUp – an old guy with a considerable white beard who was friendly but full of baloney – to be polite – and talked loudly. The bearded one told us how Hamilton came in early one morning sloppy drunk and he aided the actor to his room and into bed. He was purportedly awarded with a generous tip at the end of the month. We left when he started the story about trekking in the Khumbu region on the way to climb Annapurna in Nepal……Oh well, we agreed that this encounter is one of the reasons that sitting at the bar is fun and interesting. 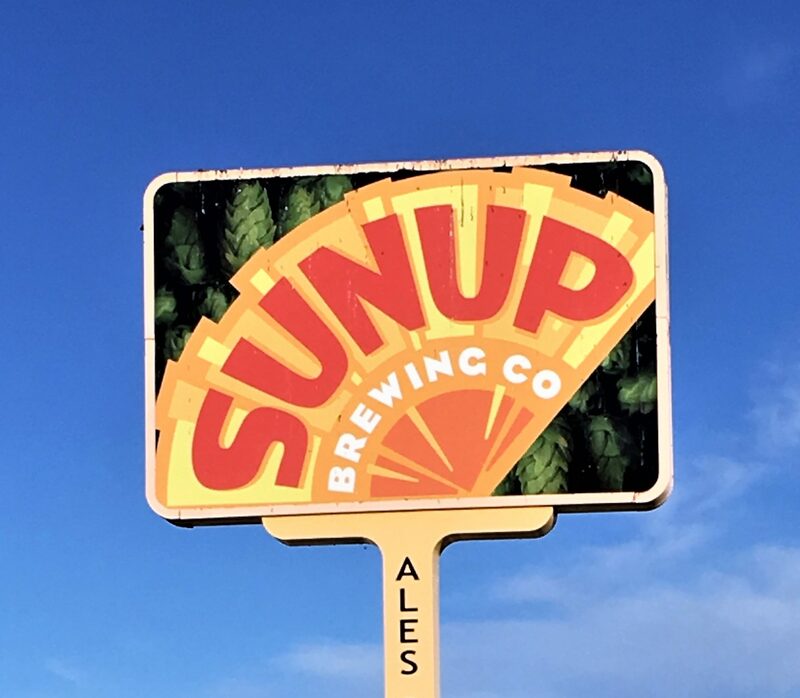 SunUp, like a number of the breweries we visited, has expanded as the beer culture in the desert has intensified. For example in 2014, they produced 800 barrels, but after expansion, rolled out 3,000 the next year. 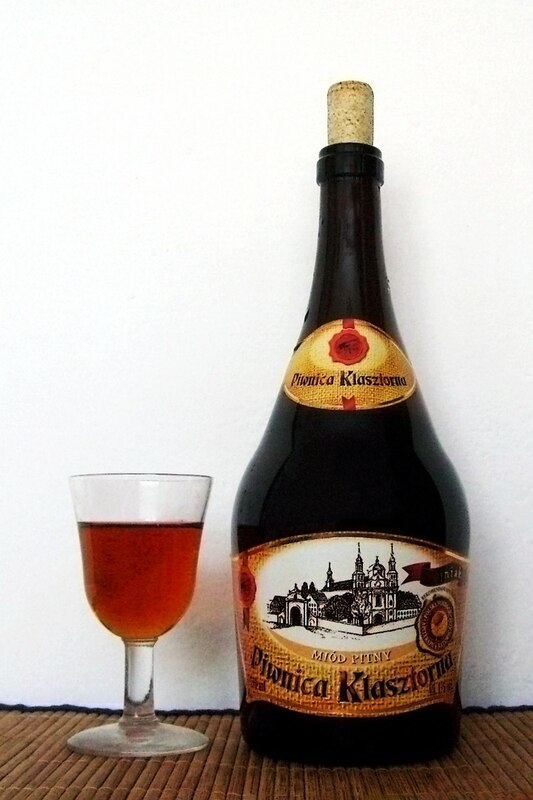 An example of mead – A Polish mead using two units of water for each unit of honey. They ranged in price from $10 to $16 for a 5 ounce glass – not only expensive but the ABV averaged 13.5% which explains the small glass size. That night, again based on recommendations, we had beers and dinner at McFate Brewing. Ryan was our favorite bartender in Arizona. It’s the first pizza I’ve had with an egg (over easy) on the top. Notwithstanding its good size, we did not take any back to the hotel like the reviewer above. 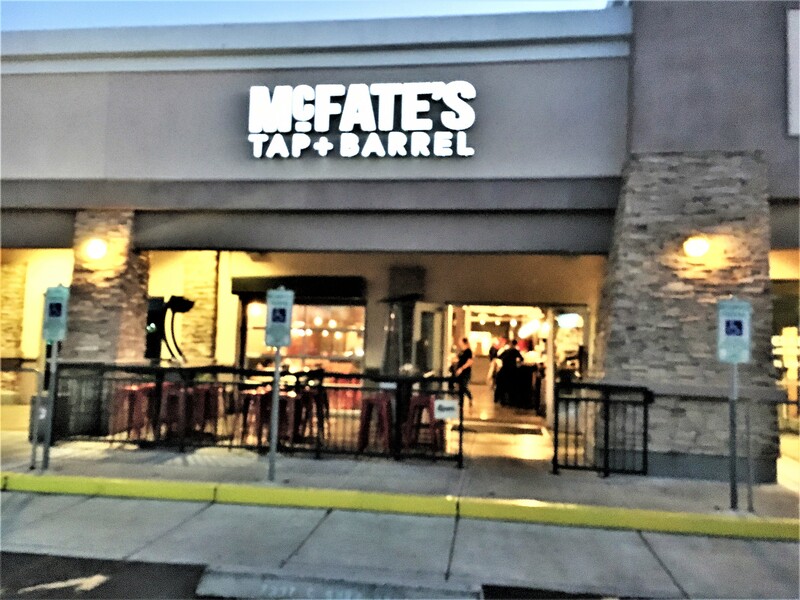 McFate’s, opened by a former financial exec in 2010, could not meet the demand for their beer and expanded in 2015 with another location in South Scottsdale and now has a 15 barrel capacity. 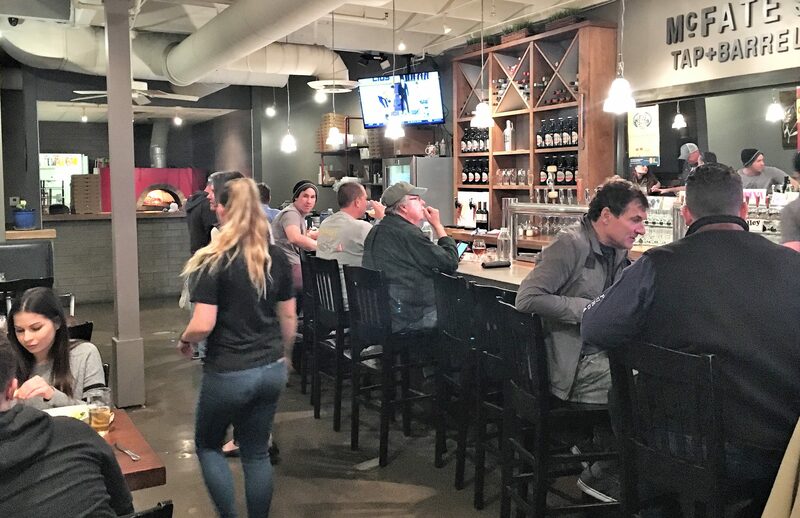 We were at the original brewpub which is not a large space, but it has a good vibe, friendly staff, robust selection of good beer and great food. – What more can you ask for? ?